Nissan Murano Forum > Model Specific Discussions > 3rd Gen (2015+) > Reset airbag light on the dashboard? 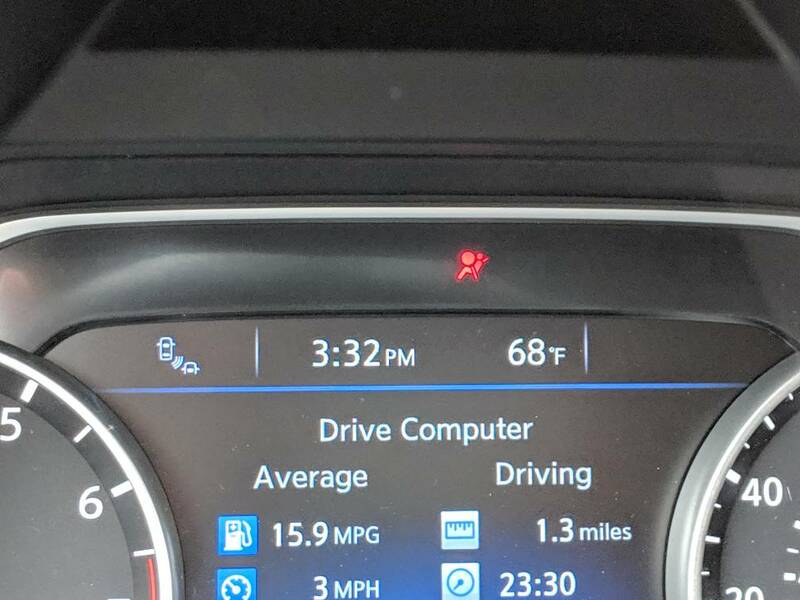 Reset airbag light on the dashboard? Anyone knows how to reset the air bag light on my dashboard manually? It stays solid red on my dashboard. I know there is nothing wrong with my airbag, I saw it after I finished installing my audio and sub amp under the seat, I must have touch something that triggered it, although I disconnected the battery when I was doing the install. I saw some video online where you can reset the airbag light by tuning on and off the car at special intervals, but that was for the second generation. Not sure if the 3rd gen has the same feature or if they eliminated it. The dealer want $150 to reset it by re-downloading the software. Hi Assad, I have the same problem, yesterday I install my new amp, after I put the battery back, the ligth still on. Do you find a solution? Unfortunately, the only way to reset it is to take it to the dealer, they have the nissan consult tool which can reset it. I trust the Airbag light "on" has nothing to do with the proper operation of the airbag, it will deploy in case of an accident. I trust the Airbag light "on" has nothing to do with the proper operation of the airbag, it will deploy in case of an accident! That is correct Max, especially after you install an amp, they have sensors that can trigger the light, but doe not mean it is not operational. Mine has been on since I installed my amp, and I cannot justify myself to give the dealer $150 just to hook up a plug and press a button to reset it. I am also on same boat after installing my amp today , so there is only way to reset it by going to the dealer ? I saw tis somewhere for 2015+ Nissan, curious now if it'll work. It's not blinking , it remains on "a solid red icon" , i tried the reset method (which was for blinking icon) it didn't work for me. Well, I got some great news!!! Thanks to @MuranoSL2003 for letting us know about this tool, and the developer of cvtz50 for the commands. Thank you @assad for the demo & saving me $150 , thanks to @MuranoSL2003 as well. I just ordered my OBD II ELM 327 adapter to test this app & glad that I won't have to see the red light again. I am removing the command per request of the developer. I guess every car is a little bit different based on the revision, and it can have reverse effect if you send the wrong command. So the best would be to contact the developer after you buy the app, then he will send you a command for you to send to your your car, then send him the output, based on the output, he will send you the reset command. Good. CVTz50 should get ability to clear airbag DTC in the future, but the problem is that there is no universal solution. For now, please avoid sharing this command since it fits only specific control modules. It can give unexpected result on other revisions of control modules even within Muranos. Thank PaulDay, he's the guy who mentioned this cool CVTz50 app about a year ago, and several times since! It's awesome the developer provides the support for custom commands too! Everyone should purchase CVTz50, it's really a must have app for your Murano, and the only one that I'm aware of that displays both regular DTCs and CVT codes, and does MUCH MUCH MORE! assad and PaulDay like this. Thanks. And to be honest, I picked up on it when someone posted about it and everyone thought it was spam, instead of checking it out. I checked it out and started spreading the word. I've been rattling the cage door for some time with CVTz50. Guess someone has finally found the key, lol. You can't say enough about this program. The more people support this guy, the more likely he'll keep adding. FYI, I have no vested interest in the program or author, just know a good program when I use it.